For the last year, I’ve been blogging about the three pillars of the Open Government Initiative—transparency, participation and collaboration. Each pillar points at the same theme: the Government cannot provide the best value with taxpayer dollars on its own. External partners are crucial to ensure value is maximized. Furthermore, Open Government in itself is not the mission of any Federal, state or local government; however its principles do help agencies achieve their particular missions more effectively. In practice, aligning these principles with existing programs and practices can be incredibly complex. In this week’s blog posting, I will describe one complex mission area and how Open Government principles may advance its provision. Complex Mission Provision: Encouraging Livable and Sustainable Communities This year, leveraging Open Government principles, the Department of Housing and Urban Development (HUD) and the Department of Transportation (DOT) openly collected public feedback on their draft strategic plans (HUD used uservoice whereas DOT used ideascale). The Environmental Protection Agency (EPA) also collected public feedback on their draft strategic plan during June and July of this year. HUD, DOT and EPA share one common strategic goal: to encourage livable and sustainable communities. Duany, Plater-Zyberk, and Speck distill the issues surrounding sustainable communities phenomenally in their book “Suburban Sprawl: The Rise of Sprawl and the Decline of the American Dream”. In this book they describe how throughout the last century many government policies and professional standards have contributed to sprawling communities in America with underperforming schools, pollution, traffic and congestion, crime and unaffordable housing. 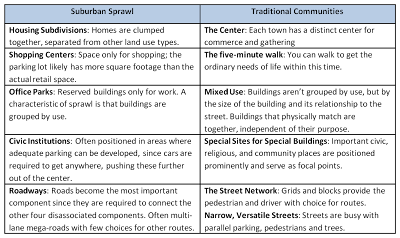 But what defines “suburban sprawl” and how does this urban development model create communities that differ from traditional communities?Table 1, below, describes the differences between traditional communities and those developed as a result of suburban sprawl. 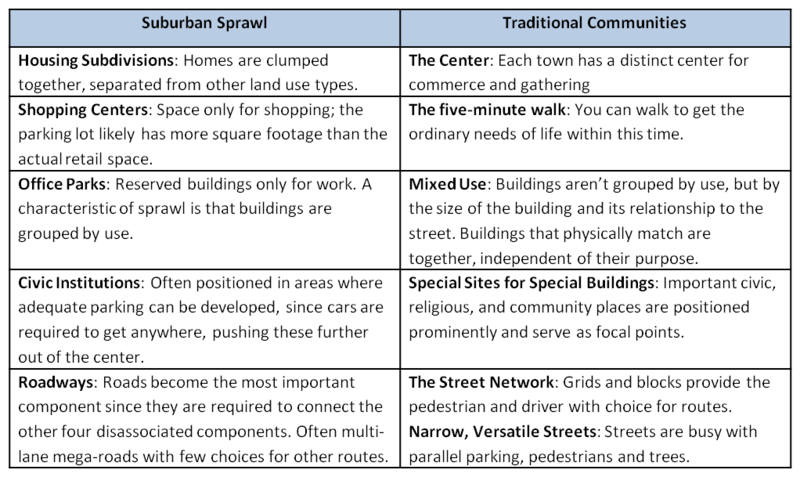 The clumping of land-use types in sprawling communities is partially a result of Federal policies after the Second World War, including the terms of FHA and VA loans that encouraged the construction of new homes and not the renovation of existing homes, the interstate highway program, and the neglect of mass transit . On top of these Federal programs and policies, the planning profession worsened the physical separation of the aspects of daily life through zoning laws which require housing types, commercial and civic buildings to be separated. But why should these differences matter to each of us and why is “livability” an important strategic goal for HUD, EPA and DOT? Given the coordination challenges across the Federal, state and municipal governments regarding livability issues, the need to engage experts in problem solving, and the responsibility of each citizen to advocate for their community, the livability mission area is ripe for more effective use of Open Government principles. In particular there are several ways that each level of government could “open up” and better coordinate community planning. Municipal level: Local planning should be done with public participation . This can include developing community master plans, monitoring compliance with guidelines, advisory committees and ongoing feedback and ideation. Regional level: The US largely lacks regional government. Coordination between municipalities for regional planning is largely based on loose partnerships. This is not necessarily a problem if effective public-private partnerships amongst municipal and state governments and appropriate private partners can be formed and sustained to address regional issues. Regional planning and partnerships should be incentivized. State level: At this level, interrelated issues begin to become siloed. In the words of Duany, Plater-Zyberk, and Speck , “[if state DOT’s] wish to play a role in the creation of healthy communities, [they] must come to view transportation policy as an integral component of a regional land use plan, not just as an autonomous problem with a financial solution”. Transparency with spending data, participation in the planning process, and collaboration between state agencies with different missions are crucial to expose areas for improvement. Determining how Federal funds trickle down through grant programs to fund state and municipal government’s development funds. Without coordination and engagement with other Agencies, the public, and experts on policy choices about what to do with Federal funds, these grant programs can work against each other rather than complimenting one other. Determining how to address the decline of the Highway Trust Fund and the lack of money to adequately fund sustainable transportation. The Federal government should be prioritizing developing innovative approaches to transportation financing (in addition to FHWA and FTA’s efforts), including how to best leverage private capital and expertise through non-traditional means. This could be an area ripe for prizes and competitions. Leveraging household, workforce, transportation, and labor data to inform decisions about place-based policy making (CTPP has a lot of great information here). In general, government policies often exist to correct some sort of perceived market failure or need. Open Government can help by providing the government with more complete information on what market failures exist and what needs the proposed policies may fill (or hinder). Livability is an example where embracing Open Government principles at ALL levels of Government could help improve policy choices and each American citizen’s quality of life. Are you aware of any examples of where transparency, participation and collaboration at the municipal, regional, state or Federal level is happening currently to address livability? What’s working? What’s not working? I look forward to hearing your thoughts and as always, please feel free to reach out to me at any time during this series to continue to conversation. Also, if you’re interested in more discussion about this subject, I encourage you to register for the GOVgreen Conference & Expo (http://www.govgreen.org/ ), Nov. 9-10 at the Washington, DC Convention Center. Duany, Plater-Zyberk and Speck. Suburban Sprawl: The Rise of Sprawl and the Decline of the American Dream. North Point Press. New York, NY. © 2000. P 7-8. Duany. P 119-125. Duany, P 56. Duany, P 7, 127-29. Duany, P 115. Duany, P 226. Duany. P 231.